Media: graphite pencil on white paper, captured with digital camera and processed with Gimp. 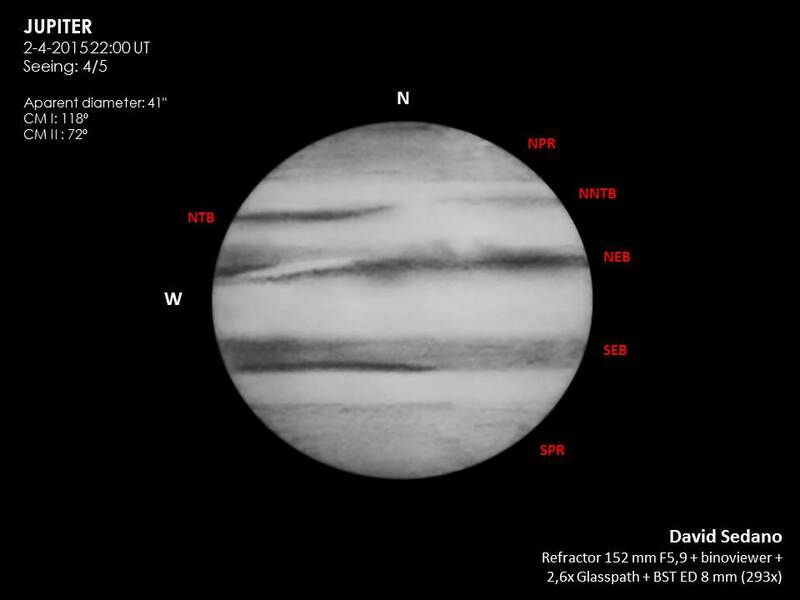 Hi This is a sketch of the planet Jupiter made throught my 6” achromatic refractor (TS Individual 152/900), binoviewer, a pair of 8 mm eyepieces and glasspath that gave me 293x. The seeing was very good during all the observation, allthought the arriving of high clouds at 01:00 am ended with the fun. It was remarcable the wedge that seems to divide the NEB and a bright patch between this belt and NTB that reminds a great oval. Fantastic detail in your Jupiter sketch. I have heard the binoviewers made for an almost 3D expereince through the eyepice. Your Jupiter looks as if I could touch it! Nice work. Thank you very much for your comment Cindy! Since I purchased the binoviewer I can´t do a planetary observation without it. The view with both eyes is more relaxing and efective.